In OneNote, you can add as much content to a page as you’d like—you’ll never run out of space. If you’d like to get organized, you can create additional pages at any time. On the right side of the window, over the column of page tabs, choose Add Page. Type a page title into the heading area at the top of the page, and then press Enter. You can organize pages by dragging their tabs up or down in the page tabs column. To get things to look exactly as you want, you can apply a template to a page and you can create a subpage. 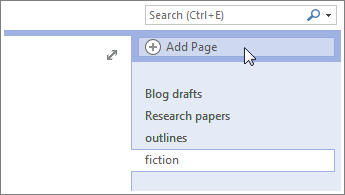 Tip: If you accidentally create a page that you don’t need, right-click its page tab and then click Delete.